Question: What do the following numbers represent? Answer: The number of Senators voting for the SORT, START I, INF, ABM, START II, Limited Test Ban Treaty and the Chemical Weapons Convention. One of the conclusions that Dan Caldwell and I reached in our edited volume, The Politics of Arms Control Treaty Ratification (1991), is that it’s easier to secure eighty votes than the bare two-thirds majority required for the Senate’s consent to treaty ratification. Presidents don’t round up 80-plus votes without the endorsement of the Senate’s Minority Leader. No arms control treaty has yet to receive the Senate’s consent if the Minority Leader sides with his Party’s irreconcilables. 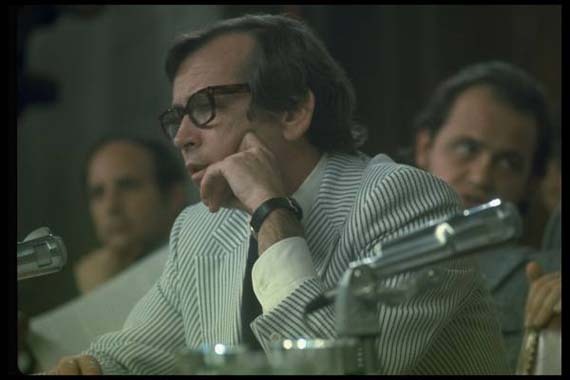 The SALT II Treaty’s fate was sealed not just by the Soviet invasion of Afghanistan, but also by Senator Howard Baker’s opposition (above, in seersucker). Baker, the Republican Leader who previously antagonized the conservative wing of the Republican Party by supporting the Panama Canal Treaties, was then contemplating a run for the presidency against Jimmy Carter. Bill Clinton managed to secure the Senate’s consent to ratification of the Chemical Weapons Convention when Republican Leader Trent Lott accepted conditions brokered with the White House that undercut the CWC’s monitoring provisions. When Lott later sided with irreconcilable opponents of the CTBT, the test ban treaty was doomed. Presidents seeking overwhelming majority votes in the Senate have employed several methods to avoid what historian Arthur Link (in Woodrow Wilson, Revolution, War, and Peace) called the “supreme error” of making treaty ratification “a hostage of party loyalty and politics.” Link was referring to Wilson’s stunningly maladroit approach to the Senate which included, immediately upon returning to the United States from Paris, a rousing speech on behalf of the League of Nations in Boston, the home town of Henry Cabot Lodge, who served both as the Republican Leader of the Senate and the Chairman of the Foreign Relations Committee. In stark contrast, Senator Lodge was enlisted by Secretary of State Charles Evans Hughes to serve on the U.S. delegation to the conference that produced the Washington Naval Treaties. Hughes also enlisted the participation of the Senate’s Minority Leader, Oscar Underwood. Secretary of State Henry L. Stimson used this playbook when negotiating the London Naval Treaty. His negotiating team included the Senate’s Minority Leader, Joseph Robinson, as well as the Chairman of the Senate Committee on Military Affairs, David Reed. Both were needed, as the Chairman of the Senate Foreign Relations Committee at that time, William E. Borah, was an irreconcilable. President Kennedy agreed to a “safeguards” package to ease Senate concerns over constraints on nuclear testing, and President Nixon signed off on significant strategic modernization programs to secure overwhelming congressional support for the SALT I accords. What does this mean for another attempt to ratify the CTBT? If the Minority Leader, Mitch McConnell, sides with his second in command, the irreconcilable Jon Kyl, the Obama administration will have to achieve something no other administration has accomplished: secure an arms control treaty by finding just 67 votes in the Senate. Having senators in the negotiating team makes sense. Given the poise with which the current administration has handled many affairs of state, it would seem that achieving ratification without Mitch McConnell might just be possible.